Product Details-Composition- Cypermethrin - 1% w/w. 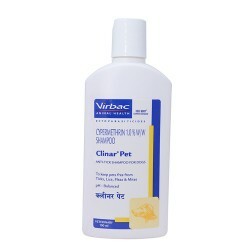 Use- Virbacs Clinar Pet is one of the tools to empower you in this fight against bloodsucking and disease spreading ticks, fleas, mites and lice, Suitable- All Breeds Dogs Quantity -100ml. 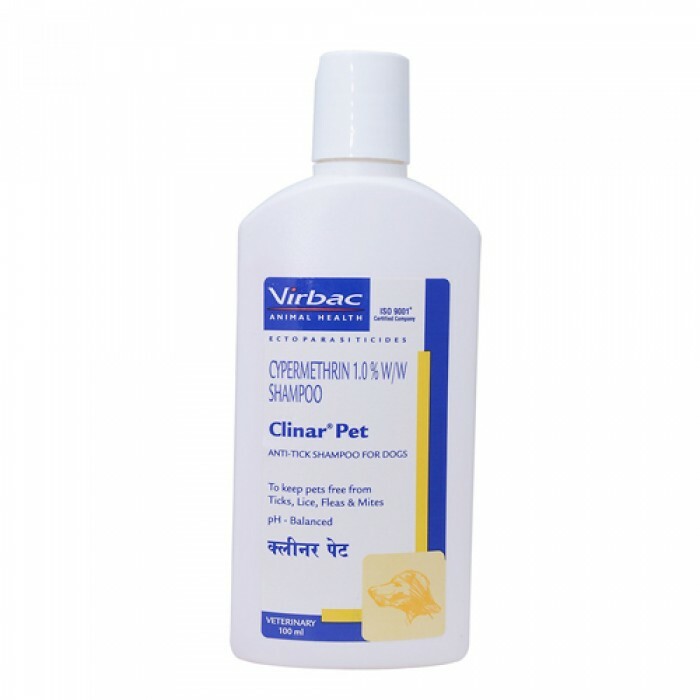 Product Information -Virbac Clinar Pet is an anti-tick shampoo for dogs which has been designed to keep the pet free from ticks, fleas, lice and mites. The threat of parasites is always there, whether the dog is healthy, happy, active or inactive, it does not differentiate. You need to be active, observant and prepared to handle the problem as and when it comes to your notice. Virbacs Clinar Pet is one of the tools to empower you in this fight against bloodsucking and disease spreading ticks, fleas, mites and lice.The anti-tick dog shampoo is pH balanced and safe for the dog. Directions for Use-Wet the coat properly.Apply sufficient quantity into the coat, especially the affected areas. Take care to avoid eyes and ears. Massage well into the coat and work out a rich lather. Allow it to stay for 5 to 10 minutes. Rinse the coat with clean water at least 2-3 times. Repeat treatment after a week or as instructed by the veterinarian.